Sitting above the city or Rapperswil, the castle and it’s church (St. John's church) have a very commanding view of the city, lake and the alps. Rapperswil is often referred to as the „town of roses“ (Rosenstadt) and at the foot to the inner gate to the castle there is a coat of arms representing this name with two roses. 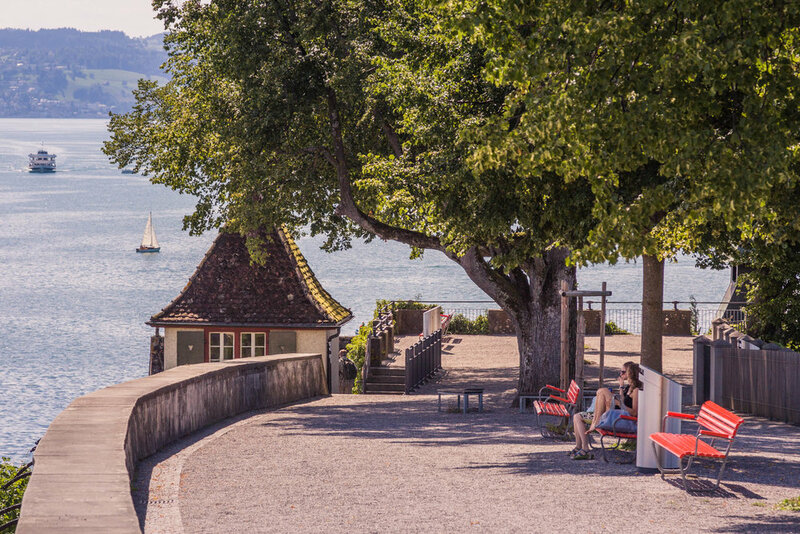 To get to the castle you can walk through old Rapperswil and climb a wonderful set of stairs up to the castle and the St. John’s church. From here you can enter through the castle gate. 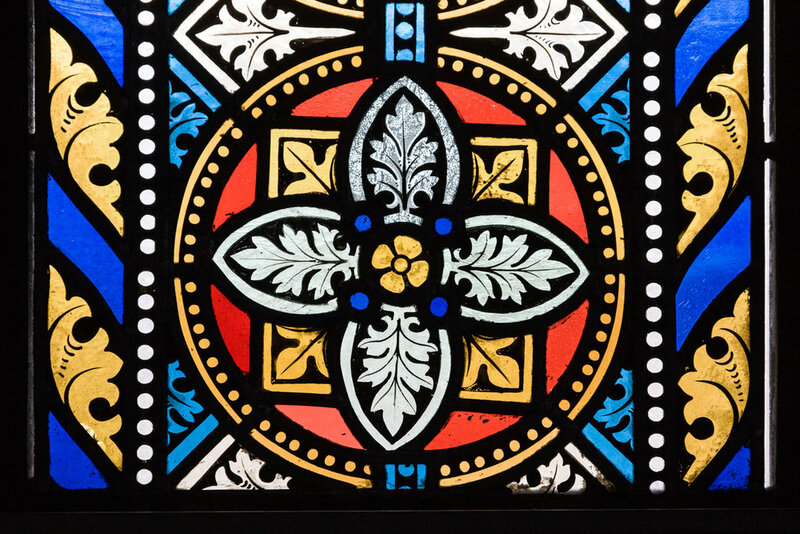 A visit the to St. John's Church and it's beautiful stain glass windows is also worth the time. The castle grounds are well maintained which also includes animal park with deer. The view overlooking the city and the lake is very beautiful. You can also walk down to the promenade that allows you to walk around the whole castle along the lake. There’s also a rose garden and some vineyards. The view over the rooftops is also very picturesque and you can see into the harbor. There isn’t all the much to explore on the grounds themselves. 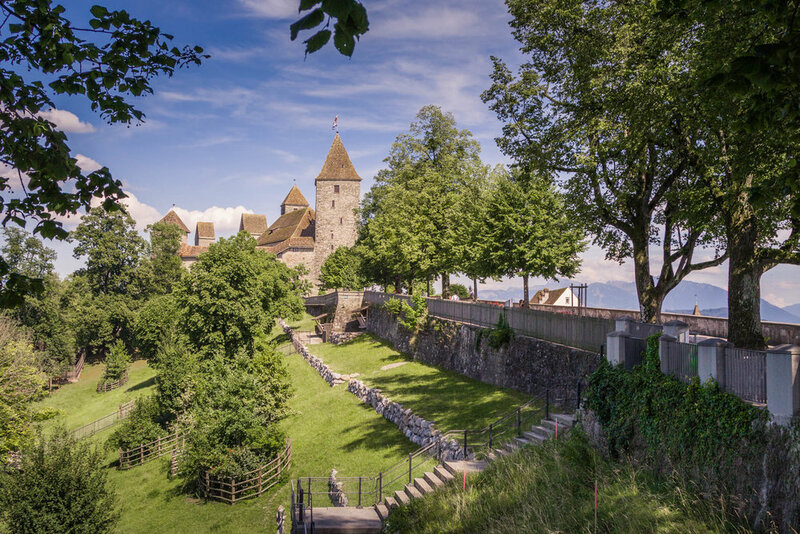 If you decide to visit this castle it would be well recommended to visit old Rapperswil and it's charming historical old building and alleyways. When you enter the main gate of the castle, there is a large courtyard that is used for events. There is nocastle museum only the Polish museum, which has nothing to do with the history of the castle. However if you visit the museum you might get some impression of the size of the castle from the inside. The rest of the castles interior is off limits. In 2008 there was a petition to remove the Polish museum and establish a Rapperswil museum in the castle. This however this didn’t happen and the Rapperswil museum is still located only a few walking minutes outside the castle walls. If you have the time, it might be worth it to make the trip down the lake on board one of the ships that travel between Zurich to Rapperswil every day. This way you can view the castle as you approach the city from the ships decks. Rapperswil Castle dates back around 1200 to 1220 AD, and it was first mentioned in 1229 on occasion of the foundation of the Rüti Abbey. The castle and the fortifications of the former locus Endingen (given by the Einsiedeln Abbey) were built by Count Rudolf II and his son Rudolf III von Rapperswil, when the nobility of Rapperswil moved from Altendorf (Alt-Rapperswil) across the lake to the other side of the so-called Seedamm, maybe to establish their own parish church and to avoid to go the mess, by crossing the lake, in St. Martin Busskirch. The castle was given to the citizens of Rapperswil in 1442. Later the castle was controlled by the Swiss confederation. Over the course of time, the castle fell into disrepair and in 1870 was leased for 99 years to a Polish Count. At his own expense Count Wladyslaw Broel-Plater restored the castle, and on 23 October 1870 the Polish National Museum was established.